Borderlinx | Buy Sony and ship worldwide with Borderlinx. Cheap rates guaranteed. When you think of the best audio, music, television, and electronics companies in the world, chances are that Sony USA is among them. Sony USA has been offering only the best in music and audiovisual quality for generations, from bringing the world the music of Michael Jackson to Adele, to the groundbreaking technology of 4K television. Professionals and recreational users alike have depended on Sony USA items for decades, whether they're interested in photography, AV equipment and hardware, music production, or a myriad of other technological endeavors. Discover what Sony USA can bring to your life today! Sony USA is a global leader in many technological industries, always pushing the boundaries of what we know and can accomplish. Sony USA productsprovide that same capability and challenge to their users as well, and customers looking for cameras, tablets, smartphones, game systems, computers, and more have the ability to do more than ever, all at competitive prices. There are lots of reasons to choose Sony USA, and customers can feel great as they shop. Sony USA initiatives include eliminating its carbon footprint by 2050, supporting environmental organizations such as the Wildlife Conservation Society, volunteering, providing grants, and supporting communities across the globe. 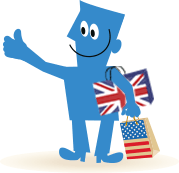 Now with Borderlinx, international customers can buy Sony in the USA! With cheap shipping, tax & duties calculated by our Shipping cost calculator, Borderlinx will ship your order right to your home. Services such as concierge, free repacking and consolidation are available through Borderlinx to make international ordering Sony USA hassle-free.